Now You can make two sandwiches in a matter of minutes with the Russell Hobbs 2 Slice Sandwich Maker, just put in the bread, insert your favourite filling, and then top it off with another slice of bread and close the lid. Your sandwich will be hot and ready in minutes. 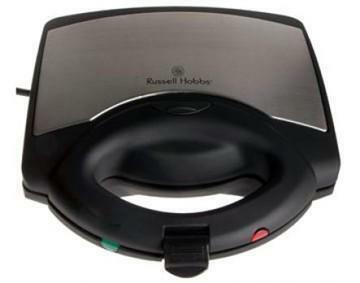 The Russell Hobbs 2 Slice Sandwich Maker [RHSM-035] comes with a non-stick surface which lets you toast or grill a sandwich easily without sticking to its surface. You can place this compact and sleek sandwich maker on your kitchen slab or table. Stands upright with cord wrap storage for ultimate space saving.